A group of farmers and scientists are stabilizing the Alabama oyster industry by creating their own aquaculture infrastructure. 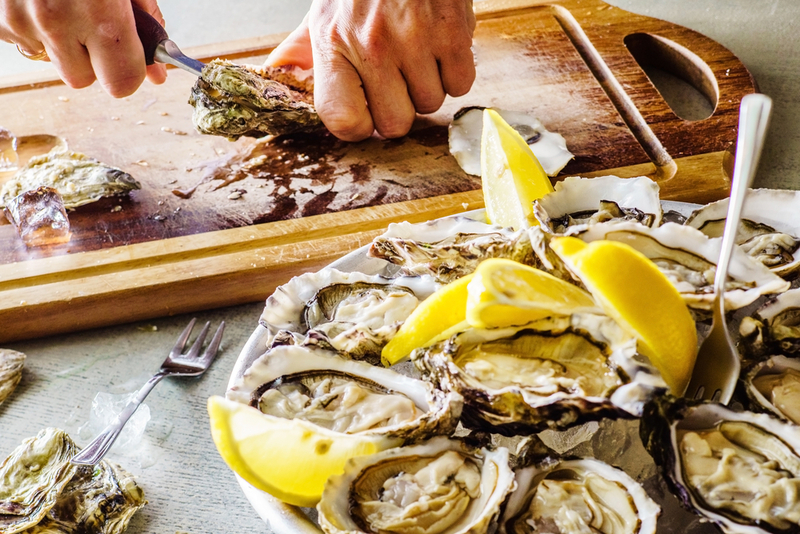 In a good year, the Gulf of Mexico produces up to 500 million pounds of raw, shucked oysters that help feed the economies of Gulf states like Alabama, Louisiana, and Texas. But the industry has suffered devastating losses for more than a decade, leaving almost 10,000 workers in Alabama–historically the largest oyster processor in the U.S.–without a way to make a decent living. In 2004, Hurricane Ivan wiped out 80 percent of Alabama’s oyster crops. Katrina came the next year, crushing newly replanted oyster reefs and any hope that Mother Nature was on the state’s side. When the Deepwater Horizon Oil spill happened in 2010, things seemed hopeless. Droughts, natural predators, overharvesting, and freshwater diversions of the Mississippi River have also decimated an industry that has thrived in the South since before the Civil War. But, despite these natural and manmade setbacks, Alabama is focusing on turning its losses into assets on the half-shell by creating a market for local farmed oysters. In 2009, a scientist from Alabama’s Dauphin Island Sea Lab saw something special in the state’s oysters. Dr. William Walton, Associate Professor and Extension Specialist at Auburn University, watched the rise and fall of the wild oyster industry in the Gulf and saw how crucial the industry was to the livelihood of Alabama’s coastal communities. In Alabama, oysters have been traditionally harvested by the old-fashioned method of tonging. Small boats use rakes on the ends of long, wooden poles to gather oysters from public reefs. There is not a lot of commercial dredging going on in Alabama, like there is in Louisiana. That means fewer jobs. And, fewer jobs means fewer Alabama oysters. What Walton noticed was that oysters were being harvested from the unreliable waters of the Gulf Coast, thrown into containers and labeled as Gulf Oysters. They could be from Texas, Louisiana, Mississippi, or Alabama—it didn’t matter. Oysters from any Gulf state were sent to a processing house in Alabama and shucked, then packaged into a container by a dealer and sold. It was a generic process. While Walton knew there would always be a place for traditional oyster harvesting and shucking, he thought there was also room for distinction. You could track oysters from states like California, New York, and Washington to the unique coves and inlets where they were grown—why not do the same in Alabama, and help stimulate the economy in the process? In 2009, there were zero oysters farms in the state. Now there are 13. They range in size, from those just starting out to those who sell out before their harvests begin. And because there’s still demand for shucked oysters that grow naturally in the Gulf, these new farms don’t compete with local fishermen. Restaurants in the South are taking note. Southern culinary hotspots are featuring farm-raised Gulf oysters as mainstays, with at least six new oysters bars cropping up all over the region in the past two years. For Chef George Reis of 5 Point Public House Oyster Bar in Birmingham, Alabama, it’s all about merroir—those unique flavors that are evident by the different farming processes the oyster farmers use, as well as the flavors produced by different environments. He’s been in the business long enough to know just what the right oyster can do for sales. In addition to his new oyster house, he also owns a high-end seafood restaurant that sells some of the world’s best known oysters, like Malpeques from Prince Edward Island and Kumamotos, which were originally from Japan, but are now farmed on the West Coast. Photo credit: Oyster shucking Shutterstock/Shebeko; Gulf Coast oysters by JH Daniel.